My STNA journey this week took me to The Woods on French Creek, our 75-bed facility in Avon. Rob Peterson is the Administrator at French Creek, and the building had an incredible feeling the moment I entered the doors! I had the privilege of working with Paris Grubbs and Alexus Espitia. Paris came up to the front office and I was introduced to her. She told me we would be working the front rehabilitation unit today and asked me if I’d like a tour of the building. I told her I would love that and we went all throughout the building as she introduced me to fellow staff members and residents along the way. That same positive energy I felt when I first walked in, I felt throughout the entire building. It was cool to see staff smiling and talking to residents as they went about their daily tasks. As Paris and I got to caring for the residents on our unit, I was so impressed with her interactions with her fellow staff and residents. She would ask a team member, “Love, do you need help?” or ask a resident once we finished care, “Ok love, you’re all set, is there anything else we can do for you?” There was nothing put on or fake about it, it was a sincere expression of teamwork and caring that came from her heart. As we worked, I asked Paris a little about herself. She shared with me that she was a phlebotomist and wanted to get into a job that she had more day to day interaction with residents. She decided to become an STNA, and she is coming up on her 1 year anniversary as a nursing assistant in April. Her goal is to become a nurse, but being a single mom with two kids, it’s difficult to save the money and find the time to work and go to school. I told her about our company’s tuition reimbursement program and she loved hearing about that as something we offer. I also told her about the Ohio Health Care Association’s Scholarship award. Each OHCA awards several scholarship at various levels (up to $8,000) for the upcoming school year. After assisting a few residents, Paris introduced me to Alexus, her caregiver teammate for the day. Alexus has the same amazing loving and caring attitude that Paris has, and I immediately felt a connection with her as well. Her interaction with her residents were filled with love and compassion. As we went to various rooms answering call lights, I began asking Alexus questions about how she got into long-term care. Alexus told me how she became an STNA to help care for a family member at home. She loved it and decided this was the career for her. She also shared with me that her grandmother, someone she looks up to very much, has been an STNA for 34 years at the same facility. Caregiving is something that runs in her family. Alexus shared with me that she is also a single mom with two children and that she has to take her children to daycare when she goes to work. She told me her daycare costs $200-$300 a pay period, depending on how much she uses them. Alexus shared that often she wants to come in and pick up a shift as a caregiver, but has to decide if she can afford to, due to the added cost of daycare. I would love as a company to help our employees in this situation figure out a solution. After lunch, Paris, Alexus, and I were together for a bit as they were charting. I asked them both what they loved about working at French Creek. 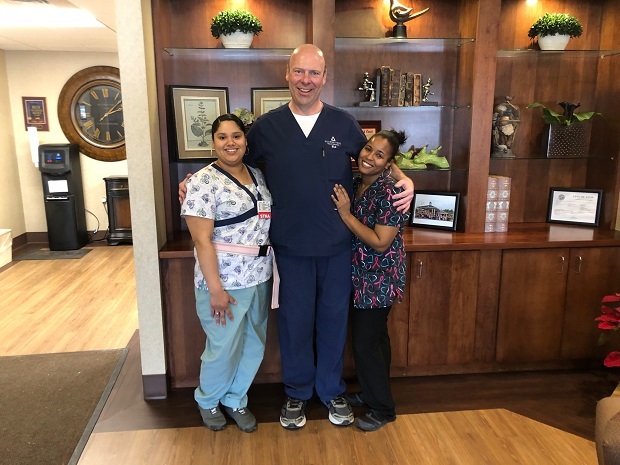 Without missing a beat, they both said “the teamwork here.” They told me that they appreciate how the management comes out and helps every day in the mornings when they are super busy. Further, they said several nurses help answer call lights and assist with residents, not because they have to, but because they are part of the team. What they were describing is what we mean when we talk about our “Culture of Care” as a company. Everyone working together for the goal of caring for our residents and caring for each other. It was an amazing time with two great caregivers at The Woods on French Creek today. After another week in my STNA journey, I’ve been blessed to partner with two more caregivers in our Foundations Health family, to further develop our Culture of Care. They have committed to us as a company and we need to have the same commitment to them. As a part of our team, how to overcome specific career goals and life challenges. In our Culture of Care, we are not looking for work/life separation; what we are trying to accomplish is work/life integration. We must have a reciprocated commitment between our company and our caregivers.